Home / Extra-Curricular / Team Persepolis Conquers the Thames! Don’t think these girls are taking this warm-up seriously. How nice: they’ve bought us flowers. Stiles, fences, mud, dogs, gates, cows, mud, geese, midges, nettles, mud, wasps. & did we mention the mud? Is that the taxi co? We’d like to go home now please. 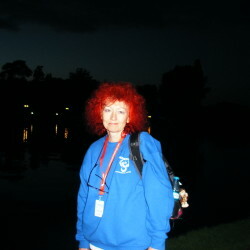 Blurry – but by that time Mrs.S. felt blurry anyway. Well, we did it. Team Persepolis walked The Thames 50km Challenge in less than perfect conditions, raised loads for charity, and lived to tell the tale. Why did we do it? Well we have posted elsewhere about Mrs.Shopkeeper’s charitable motives. 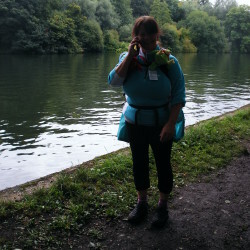 Team mate and old friend Lisette (aka Mrs.Midwife) was walking to raise money for the Polly Parrot Appeal to provide better neo-natal services at Basildon Hospital. But why were we really doing it? Well, we both turned fifty this year, and we were doing it simply because we could. To celebrate the privilege of being half a century in. & because we’re both bloody-minded tomboys. & because we’ve been doing this sort of stuff since we went to junior school together. 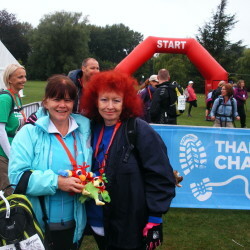 The Thames Path Challenge is NOT a stroll in the park, although it does meander through several well known parks. We actually witnessed grown men (who were admittedly doing the Ultra-Marathon 100km RUN) weep. 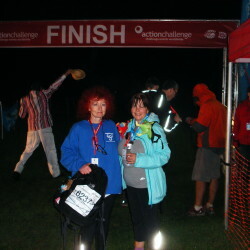 The first aid post at the finishing line was a blur of medics and masseurs and groans and very pale, wobbly looking people. The route stretches you in all sorts of ways, for only some of which can you train (and yes – we did train). 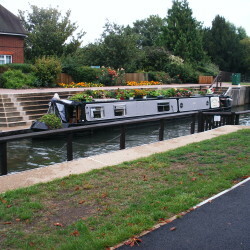 We chose the super-picturesque section from Runnymede to Henley. Mrs.S. was only slightly perturbed to realise that the distance she was walking in one day followed the route of a family holiday from way back when which actually took a week to complete: Cookham, Marlow, Boulters Lock, Hurlingham – all beautiful, chocolate box villages. Although when we shut our eyes what we can now see is not narrow boats and pretty cottages, but rather mud, cows, nettles, geese, mud, fences, midges, mud, wasps, dogs, ducks and mud – did we mention the mud? As the light started to fade and a heavy mist settled on the river, the march became quite surreal – beautiful, but ghostly – and we were very glad we were not walking alone. The first 42km were, to be honest, a doddle – but at that point we reached our wall: pain set in and conversation was replaced by hysterical laughter punctuated by the odd yelp. If you had said ‘boo’ to the normally irrepressibly cheerful Mrs.S. at that stage, she would quite possibly have burst into tears. But we did it, by Jove. 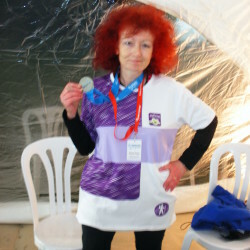 And we got a medal and a free t-shirt to prove it: this of course made it all worthwhile, because a girl will do a lot for a free t-shirt. Mrs.Shopkeeper seems to have lost her hamstrings somewhere over the course and is now walking like an extra from the Planet of the Apes, whilst Mrs. Midwife is a tad blistered and got stung by a very impertinent wasp. Impressed? 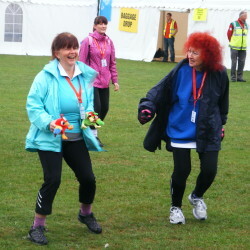 Well if you want to ease their aching joints, both of their fund-raising pages are still open for another three weeks. 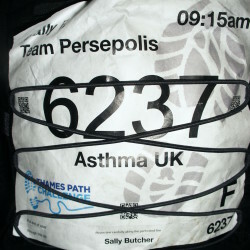 You can give to Asthma UK/Mrs.S here, and you can help Mrs.M. with her Polly Parrot Appeal here.